Annabel Karmel's frozen children's range has arrived! Renowned children’s cookery author - Annabel Karmel. Annabel has been writing books on cooking for toddlers and babies for over 20 years. 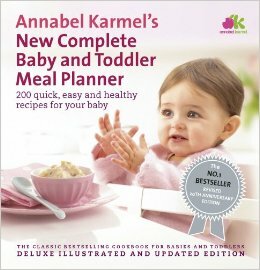 Annabel's New Complete Baby and Toddler Meal Planner has been her bestseller worldwide. In April Annabel was in Australia to promote her new range of frozen baby food in Coles. The range consists of savory meals for lunch and dinner as well as fruit deserts. The range also includes bite snacks for toddlers, such as Beef & Vegetable Bites and Chicken & Apple Bites. I have tested some samples from the range: My favorite fish pie, My first bolognese, Apple and blueberry, Summer fruit pudding. It is absolutely delicious! What is the advantage of the frozen range over baby meals in plastic pouches? Food sold in supermarkets that is stored in room temperature in plastic pouches is more processed with heat in order to make it stable in the room temperature. Annabel’s frozen range is just like home cooked meal, which is frozen immediately to lock in the freshness, nutrients and flavors. This range if free of artificial colors, flavors, and preservatives. It offers convenient and guild free options for busy parents. Have you tried AK range? Did your kids like it? What is the most favourite flavour?